Every now and then foodies need a new frontier to explore. Mine, just now, seems to be the up-and-coming world of grains beyond wheat, oats and rice. 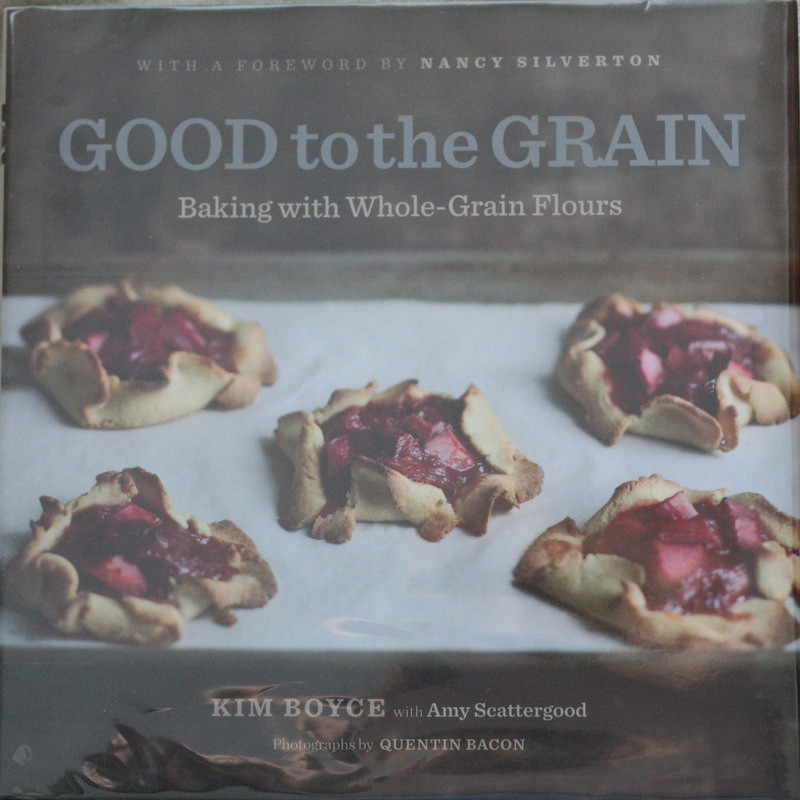 When I found Good to the Grain by Kim Boyce, I realized I had the perfect roadmap in my hand to begin my exploration. Good to the Grain delves into the history and uses of flours such as whole-wheat, amaranth, barley, buckwheat, corn, kamut, multigrain, oat, quinoa, rye, spelt, and teff. In this book, each grain has numerous recipes with mouth-watering photos meant to tempt you into branching out beyond your comfort zone and trying some of these lesser-known grains. Some of the recipes include: wholewheat: gingersnaps, apple graham coffee cake, drop biscuits with strawberries and cream; amaranth: molasses bran muffins, honey hazelnut cookies, flatbread; barley: coconut cookies, barley crepes, maple pecan granola; buckwheat: figgy buckwheat scones, kasha pudding, poppy seed wafers; corn: rhubarb tarts, cornmeal blueberry cookies; kamut: sand cookies, pumpkin pancakes, chocolate babka; multigrain: five-grain cream waffles, spice muffins; oat: granola bars, oatmeal pancakes; quinoa: honeyed crepes, quinoa cookies; rye: apricot boysenberry tarts, soft rye pretzels, maple danish; spelt: currant scones, huckle buckle, focaccia; teff: date nut bread, brown butter scones. As my family can testify, cookbook after cookbook passes through this house en route to or from the library. This was one of the few books that made it to the shortlist for almost-instant purchase. I now own my own copy, thanks to Mother's Day and my mom's generosity. 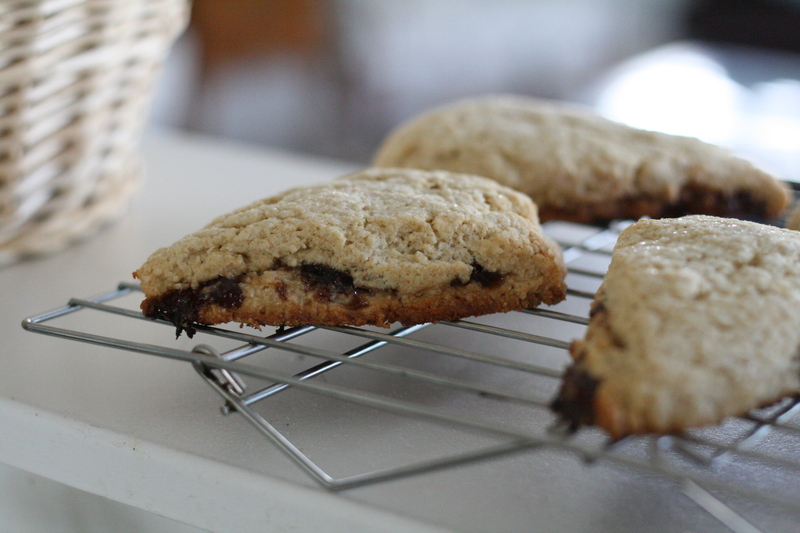 My mom was at my house the first time I made these strawberry-barley scones. Neither of us could stop raving about them, and the cookbook came with the request that I make the scones again soon. Believe me, I will! Place a rack in the center of the oven and preheat to 350F. Rub a baking sheet lightly with butter. Sift the dry ingredients into a large bowl, pouring back into the bowl any bits of grain or other ingredients that may remain in the sifter. Cut the butter into 1/2-inch pieces and add them to the dry mixture. Use your hands to rub the butter between your fingers, breaking it into smaller bits. Continue rubbing until the butter is in sizes ranging from rice grains to flattened peas. The more quickly you do this, the more the butter will stay solid, which is important for the success of this recipe. Use a pastry scraper or a spatula to transfer the dough onto a well-floured surface. The dough may be too sticky to handle; if it is, dust it with flour and fold it together a few times. Divide the dough into 2 pieces. Flour your hands and pat each piece of dough into a disk about 3/4 inch thick and 7 inches in diameter. Cover one disk with the jam. Top the spread with the other disk and press down gently so that the dough settles into the jam. Brush the dough lightly with melted butter and sprinkle with sugar. Use a sharp knife to slice the circle into 8 triangular wedges, like a pie. Carefully place the wedges on the baking sheet, leaving a few inches between them. Bake the scones for 22 to 26 minutes, rotating the sheets halfway through. The scones are ready when their tops are golden brown and some of the jam has bubbled over onto the pan. To keep the scones from sticking to the pan, slide a thin spatula underneath them while they're still warm and move them to a baking rack. The scones are best eaten warm from the oven or later that same day. NOTE: I like to use parchment paper to line my baking sheet as it prevents the jam from making a mess, and it is easy to "unstick" the scones. Where are you able to buy the specialty flours? Bob's Red Mill seems to carry most of these flours -- of course they are not cheap. I've ordered a number of them from a co-op a friend organizes. That seems to be the best way to acquire these.